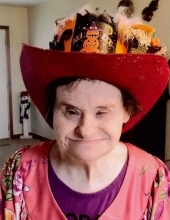 Miss Jennifer Cathy Jo Honeycutt, age 60, of Republic, Missouri, passed away with family at her side on Wednesday, March 27, 2019 in Republic Nursing and Rehab. She was born on April 5, 1958 in Springfield, Missouri, the daughter of Coy William and Ethel Emma (Hudson) Honeycutt. Cathy Jo graduated from the Greene Valley State School in Springfield and attended the First Baptist Church in Republic. She enjoyed listening to music, especially Elvis Presley, and watching old western movies. She was preceded in death by her parents; a brother and his wife, William and Linda Honeycutt; and a brother in law, Joe Seitz. Cathy Jo is survived by a brother and his wife, Russell and Joyce Honeycutt; and two sisters, Dixie Seitz, and Charlene High and her husband Lynn; several nieces and nephews; and numerous cousins. The family would like to thank the physicians and nurses on the 9th floor of Cox South Hospital, and the Republic Nursing and Rehab staff for wonderful care given to Cathy Jo. To send flowers or a remembrance gift to the family of JENNIFER CATHY JO HONEYCUTT, please visit our Tribute Store. "Email Address" would like to share the life celebration of JENNIFER CATHY JO HONEYCUTT. Click on the "link" to go to share a favorite memory or leave a condolence message for the family.